So, remember when I said the Team Tsathogga PCs were planning a heist? This is how it went down. The target was the Glasstown Academy of the Magical Arts, the kingdom's premiere institution of magical learning. When the ruthless mercenaries of the Company of the Hawk returned from Qelong, they brought with them a glass orb filled with akoum: the destructive magical radiation that had brought Qelong to its knees, which they had distilled in concentrated form from the corpses of innumerable victims in their unspeakable murder-castle. They then sold this orb to the Glasstown Academy. Abraxus, the head of the academy, and Hagen, the leader of the Company, had been carrying out research on it in a secret laboratory ever since. It was this orb that the PCs wanted to steal - partly because they had long-standing grudges against both Hagen and Abraxus, and partly because they had become convinced that their subterranean war with the Science Fungoids would only end if they could find a way to destroy the Demonspore, and smashing open an orb full of concentrated evil magic right on top of it seemed as good a way as any to pull that off. Their previous attempt to break into the academy had been thwarted by Hagen's soldiers, but they had since been neutralised: recognising that the true lifeblood of any mercenary company is money, the PCs broke into Hagen's castle and stole all his gold months ago, and had watched with grim satisfaction as most of his followers proceeded to desert him. They knew the lab itself was guarded by mirror men, so they had taken the precaution of commissioning a mirrored mask, of the same kind that the Glasstown wizards used when dealing with such creatures, in the hope that this would help to protect them. And they had started rumours among the townsfolk of Glasstown that the Academy was up to something awful and unholy, relying on illusion magic and the assistance of Sophie's ever-talkative college buddy Becky to keep the stories in circulation. Now, after months of groundwork, they felt that the time had come to make their move. Their first step was to get one of their own inside the academy. Most of the PCs were persona non grata in Glasstown due to their previous run-ins with the authorities, but their new companion Norm - an elf drug pusher whom they had befriended in the underworld - was still unknown there, and could just about pass for a (very odd) human: so he was sent into Glasstown with a bag full of gold, with instructions to pose as a foreign nobleman interested in enrolling in the Academy. The wizards were rather alarmed by Norm's strange behaviour and even stranger dress sense: but his willingness to pay their outrageously inflated enrollment fees, coupled with his obvious magical talents, were sufficient to override their doubts and allow him to register as a student. Norm promptly rented a house in Glasstown, and smuggled the rest of the PCs into it under the cover of illusion magic - all except for the obviously inhuman Tiny and Princess, who set about constructing a hidden encampment in the woods several miles from the town. Step two was to obtain a following among the students. Still posing as a newly-arrived foreign nobleman with more money than sense, Norm threw a lavish masquerade party for his new classmates, at which the wine and drugs flowed like water: using this as cover, the masked PCs then circulated among the guests, using Charm Person spells to recruit the more impressionable students into a made-up secret society. Over the next several days they gathered a group of eleven followers, inviting them to secret meetings at which they were plied with mystical-sounding platitudes, invented initiation ceremonies, and enormous quantities of mind-altering drugs. A bit like this but with way more narcotics. Step three was gaining access to Abraxus. To these ends, Norm pretended to be completely starstruck, and approached the academy with a deal: he would give them a unique manuscript that he had brought with him from his 'family library', and all he wanted in exchange was a chance to have dinner with his academic idol. After seeing the manuscript - actually a copy of Magister Sorn's research notes on the snake-man ruins of the underworld - the wizards happily agreed, and soon Norm found himself at dinner with Abraxus, stealthily spiking his food with inhibition-lowering drugs. After massaging the mage's ego with copious flattery, Norm told him a shocking secret: it had come to his attention that a rogue scholar named Simonides was delivering secret lectures to the students, free of charge, which undermined and ridiculed the teachings of the Academy. 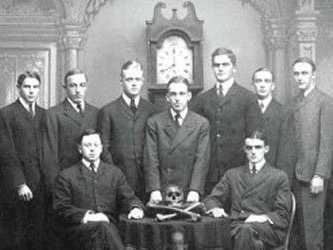 (The meetings of the 'secret society' had attracted enough attention to make this semi-plausible: it was obvious that something odd had been going on in Glasstown over the last few weeks.) Worst of all, the ideas which Simonides was promulgating had been blatantly and clumsily plagiarised from the research of Abraxus himself! Overcome with anger, Abraxus demanded that Norm reveal where this Simonides was to be found, so that he could be arrested: but Norm persuaded him that Simonides had a cult following among the students, and arresting him would only turn him into a martyr. Far better, he suggested, for Abraxus to come in secret to one of his lectures, and then defeat him in a public debate right in front of his followers, exposing him for the charlatan he surely was! So the stage was set for step four: the fake lecture. The following night, in a rented room, 'Simonides' (actually Circe) held forth to an audience consisting of the PCs and their eleven student followers, all disguised in masks and robes. Outside, Norm stood with a spare robe and mask, waiting for Abraxus. And in a shadowy corner, swathed in cloth, lurked their ally, the Sister of Seraptis: a monster of the underworld with mouths in the palms of its hands, whose fangs injected a sedative poison which reduced its victims to a state of confused docility. The plan was to coax Abraxus inside, have the creature grab him and drug him, and then exploit his bewildered state to gain access to the laboratory in which the orb was held. Free education, Team Tsathogga style. Unfortunately for the PCs, Abraxus didn't come alone: he brought Hagen with him, eager to give his fellow researcher a chance to witness what he was certain would be his spectacular victory over 'Simonides'. Norm explained to Abraxus that Hagen couldn't join him inside, as he only had one spare robe and mask, and otherwise the effect of Abraxus revealing himself to the crowd would be ruined: so Abraxus reluctantly agreed that Hagen could wait outside, at least until the true confrontation began. Norm then led the masked Abraxus into the hall, where 'Simonides' was delivering a lecture composed of mystical gibberish, plagiarised research, and demands for free education. Trembling with rage, Abraxus tore off his mask and began denouncing Simonides as an imposter, challenging him to a debate on magical theory which would prove the true depths of his ignorance to everyone present, but 'Simonides' replied that Abraxus couldn't possibly compete with his 'hands-on teaching style'. Then the Sister grabbed Abraxus from behind and sank its poisonous teeth into the back of his neck - and one failed saving throw later, the master mage was reduced to staring blankly at the audience, apparently lost for words. There was no time for the PCs to exult in this victory, however, as they knew Hagen would still have to be dealt with. Hoping to lure him inside, Norm yelled out that Abraxus had just suffered a stroke - but the only response was an odd creaking sound from the roof. Cautiously, the PCs moved out into the street outside, but Hagen was nowhere to be seen. Then, from somewhere, came a sound like the cawing of birds - and abruptly the students (and half the PCs) began to scream in abject terror as the world seemed to warp around them, the walls cracking and sliding, their bodies seemingly sloughing apart into heaps of hideous carrion. The shrieking, panicking audience fled into the street, and by the time Sovan managed to calm everyone down with a Dispel Magic spell, Hagen had already taken the opportunity to slip into the building and was starting to drag the stricken Abraxus upstairs. And what, exactly, was that huge flapping thing on the roof? The situation was now deteriorating rapidly. Sophie cast Magic Missile on the bird, but while the blast caused a rain of apparently mummified flesh and dusty feathers to pour down into the street, the creature seemed undeterred by the damage it had sustained. Circe tried her snake-man pain wand, but the bird didn't even flinch. Skadi charged upstairs in pursuit of Hagen, and threw a vial of space-acid into his chest: ashen-faced with pain, Hagen responded with a spell that sent Skadi staggering back, torn by spectral talons. Then the very real talon of the giant bird reached through the roof and lifted both Hagen and Abraxus into the air, despite the volley of spells and arrows that the PCs hurled after it, and proceeded to wing its way towards the academy. Hash moved first. His bow was already in his hands: now, with lightning speed, he sent an arrow across the room, burying itself fatally between Hagen's eyes. As the mercenary mage dropped, so too did his pet, which was now very obviously nothing more than a long-dead mummified bird. Sovan moved next, unleashing a Hold Person spell which froze both academics where they stood. Swiftly, Hash and Skadi bundled Hagen's corpse, the two paralysed magi, and the drug-befuddled Abraxus out of the window, down the rope, and over to Sophie, while Sovan rushed out and started dragging furniture across the stairwell, forming an improvised barricade to keep anyone else from coming up. High-speed barricade building is a skill every adventurer should learn! 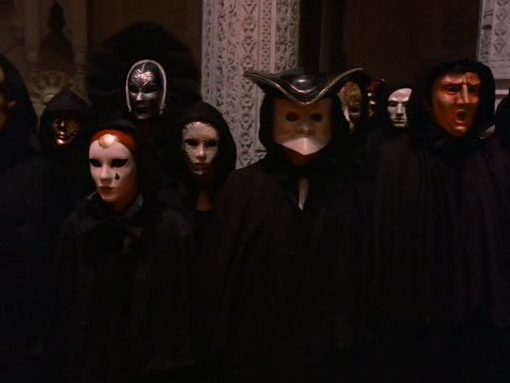 Donning the mirrored mask, Pole stepped into the lab - and found himself face-to-face with the mirror men, who the party had been terrified of ever since their first brush with them at level 1. His mask ensured that they didn't attack him on sight, but the mirror men still wouldn't let him go anywhere near the orb, and insisted that they would only negotiate with him if he showed them his face - something he was intensely unwilling to do. With the situation on the stairs getting increasingly desperate, Pole requested the mirror men to speak to him at noon the next day, which they agreed to do. 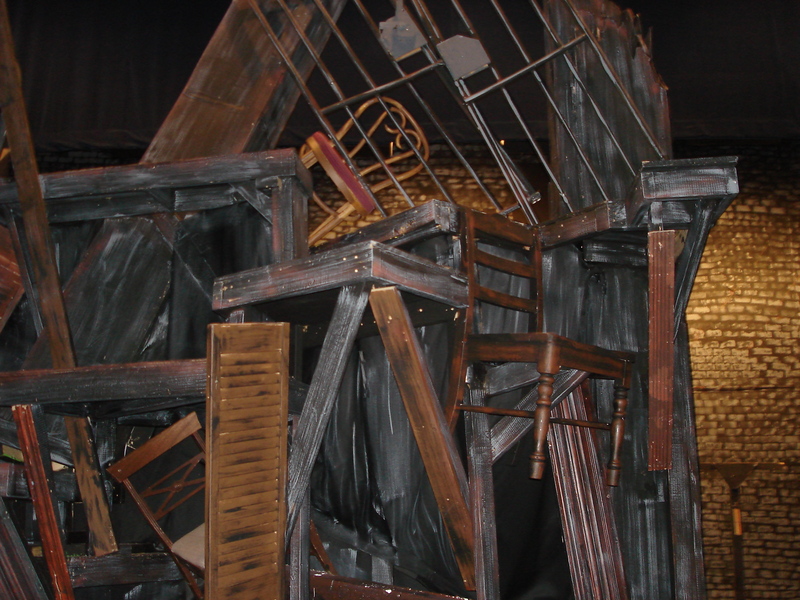 Then he, Circe, and Sovan fled down the rope as the barricade was blasted apart by a bunch of angry wizards below. Fortunately for the PCs, Glasstown was still in a stage of upheaval, with terrified crowds convinced that the wizards had unleashed some awful monster upon them yet again. Using all the chaos as cover, they escaped over the walls and fled back to Tiny's hidden camp in the woods, using the Sister to sedate their two captive academics into submission before the Hold Person spell wore off. After looting Hagen's body for spellbooks and magic items, they questioned Abraxus about the nature of his bargain with the mirror-men, learning that Hagen had provided him with some 'undesirables' whom he had handed over to them, feeding their hunger for faces, in return for their service as guardians. Only he and Hagen were permitted to enter the lab, and only he could renegotiate or cancel their contract. The next day, at noon, the PCs spread a suit of stolen reflec armour out on the ground as an improvised mirror, and Pole leaned over it wearing his mirror-mask. Sure enough, his reflection began speaking to him: and after a few more failed attempts to get the mirror-men to change their position, Pole simply had the still-drugged Abraxus come over and release them from their contract. Given that only Hagen and Abraxus had been able to go into the lab safely, the PCs guessed that it would be quite some time before the rest of the Glasstown staff realised that the mirror-men inside it were gone. Now all they needed to do was get someone inside the academy. That night, Sophie approached Glasstown from the west under the cover of illusion magic, accompanied by the Sister and her three new thralls. At the same time, Sovan and Hash crept towards the town from the east under the cover of darkness. When they were just out of sight of the city walls, Sophie stripped the three men naked and tied them together at the ankles, and the Sister ordered them to walk towards the city walls, crying out that they had escaped from their captors in the hills to the north. Sure enough, as soon as Abraxus and the other kidnapped professors were sighted from the city walls, a general alarm went up, with wizards and constables rushing out to bring them into safety and check for any signs of an ambush. While the town's guards were thus distracted, Sovan cast Strength and Silence on Hash, Hash cast Invisibility on himself, and then the silent, invisible elf slipped over the walls and hurried through the streets to the academy. Scaling the walls and climbing through a window, Hash found the lab guarded by two armed men - but he could see in the dark and they couldn't, so he shot out their lamp and used his heightened strength to shove them both downstairs while they stumbled around in the darkness and magically-induced silence. Using Abraxus' stolen key he unlocked the lab door, relying on Sovan's Silence spell to hush the alarm: the mirror men had departed with the cancellation of their contract, so nothing remained to stop him from grabbing the orb and fleeing the town under the cover of a Darkness spell. He then rejoined the others at Tiny's camp, and the whole group hastily decamped in the direction of Bright Meadows, confident that by the time Abraxus and the other academics recovered from the Sister's poison they would be far away. Witness the vengeance of Simonides! The curse of Anthrax and Judacus is upon you!! It seems to me that the majority of RPG books are in denial about their true function. Most setting books maintain the pretense that someone's going to pick them up and run them, as written, straight out of the book. That someone out there will really run a whole campaign set in Your Made-Up Campaign World, just the way you wrote it, and that when their players ask them 'Who's the mayor of this town? ', they're actually going to page through your Big Book of Made-Up Facts and give the answer that you've written down. Similarly, most adventure modules pretend - rather endearingly - that someone is actually going to run them exactly as written, right down to the read-aloud text. Monster books pretend that someone will actually use their monsters in play, giving them exactly the descriptions and statistics assigned by the book. And so on. But even the briefest comparison between the way most RPG books are written and the way most actual RPG campaigns are played will demonstrate that this can't possibly be the case. For a start, how long is the average campaign, these days? Thirty sessions? Twenty? Ten? A 10-30 session campaign doesn't need whole continents worth of detailed setting information: one home base with 5-10 adventure sites scattered around it is closer to the mark. And yet campaign settings continue to be written as though PCs will wander around in them for years and years of real-time, roaming from city to city, province to province, like a band of high fantasy Marco Polos. They trade on the fantasy of a D&D campaign as something that might run more-or-less forever, rather than reality that you're usually looking at five or six interconnected adventures at best. No-one is ever going to use your road-by-road random encounter tables! Adventure modules are, in theory, more realistic propositions, but they are produced - and purchased - in a volume that bears no resemblance to the rate at which they could actually be used. 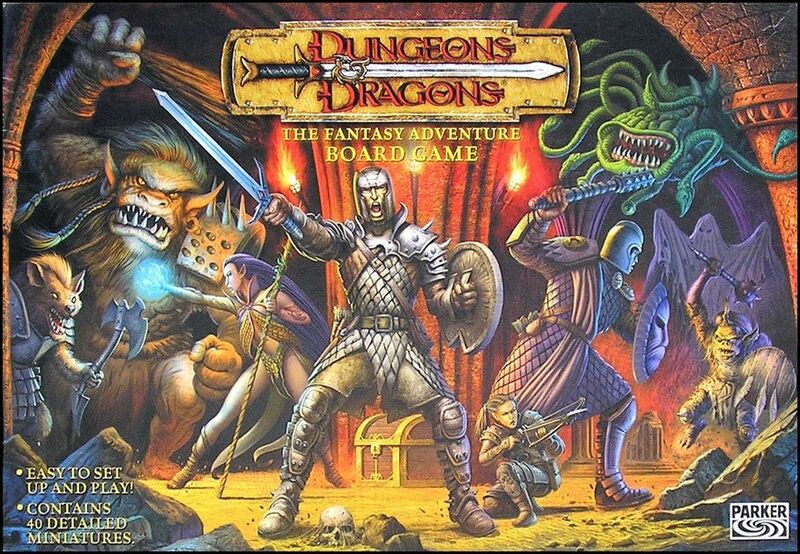 Plenty of people have bought all the D&D 5th edition hardback adventures - but playing through them all as written, at a rate of one session per week, would require a group to have been doing nothing else since 5th edition was released in 2014. The Pathfinder adventure paths are even more extreme: the Paizo forums are full of people who've read them all, but I would be surprised if anyone in the world had actually played them all as written from beginning to end. (You'd probably need to have been meeting twice a week, continuously, since 2007!) Then there are all the innumerable third-party modules which Bryce wades through so heroically over at tenfootpole. Many of those adventures probably aren't run as-written by anyone other than their playtesters (if they even have any), but people still buy them and read them. Browsing through the module reviews on RPGNow, DrivethruRPG, or DM's Guild, it rapidly becomes apparent that reviews by people who have actually played the modules, rather than just read them, are in a tiny minority. 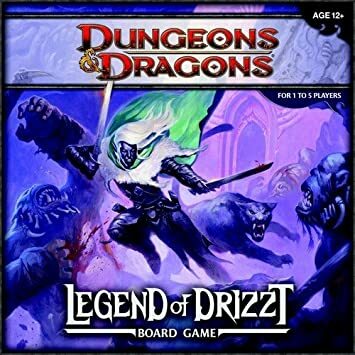 Bryce often points out that the vast majority of adventure modules are written in a way which makes them almost useless for their supposed purpose of 'running a game in real-time at the table'. This is so obvious, and so trivially demonstrable, that its continued persistence strongly indicates that this is in fact not what most adventure modules are being used to do, and probably not even what most of their purchasers want them to do, even though it's exactly what most of their authors assert they are actually for. I strongly suspect that the same is true of most published campaign settings, monster books, etc, most of which similarly seem to be written with much more of an eye to being read than to being used. Not that there's anything surprising about this: after all, if people only bought the adventure modules, supplements, and campaign settings that they actually, seriously intended to use as-written, then the whole RPG book market would be a fraction of its current size. 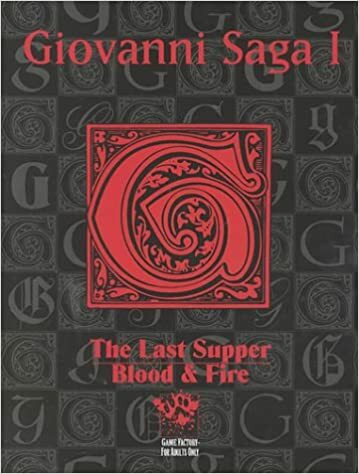 In the last two years, I've directly used six RPG books - Liberation of the Demon Slayer, Islands of Purple-Haunted Putrescence, Demonspore, Qelong, Death Frost Doom, and a couple of bits from Petty Gods - but, thanks to the magic of pdf-only bundle deals, I wouldn't know how to begin counting how many I've read. A hundred? More? Oh, Bundle of Holding. This is all your fault. RPG books written like manuals are best adapted to being used as-is at the table. Nothing else stands much chance of surviving contact with the chaotic process of actual play. RPG books written as art are best adapted to being used by people who are preparing or running RPG campaigns, and who are looking for material to adapt or borrow for their own games. Their true purpose is not to be used as-written, but to inspire GMs to come up with better material than they might otherwise have done. RPG books written as novels are best adapted to being read as a rather esoteric form of genre fiction. Thanks to 'adventures' like these, you too can have the thrilling experience of watching passively while super-powerful NPCs do things which will later be important to the metaplot! If you don't do it yourself, it can be a bit counter-intuitive to think of RPG books being read as fiction. After all, the world is full of actual stories by professional authors, most of which are rather better-written than the average RPG sourcebook: so why read an RPG book when you could read a novel instead? But I suspect that what such books primarily provide, which traditional adventure fiction does not, is a form of meta-fantasy: not a chance to imagine yourself as a fantasy hero, but a chance to imagine yourself as part of a group of RPG players who are, in turn, imagining themselves as fantasy heroes as they experience the material in the book. People read RPG rulebooks, and they imagine how much fun it would be to play a character with a certain set of abilities. They read monster books, and imagine how much fun it would be to encounter those monsters during an RPG session. They read setting books, and imagine how great it would be to participate in a campaign set in that world. They read adventure modules, and imagine how much fun those adventures would be to play in. Then they put them back on the shelf and do something else, instead. RPGs are hardly alone in this: it's well-known that people buy cookbooks on cuisine they'll never seriously attempt to cook, guidebooks on places they have no real intention of visiting, magazines full of detailed reviews of things they'll never be able to afford to buy, and so on. Reading about things usually isn't as satisfying as doing them, but it's much easier and less risky: reading an adventure module and daydreaming about playing it is a pleasant and undemanding way to spend an hour, whereas actually running it would require time, organisation, commitment from several people, and a real risk of failure or disappointment. I'm pretty sure that Paizo, at least, are well aware that more people buy their adventure paths to read than to play. Their whole business model makes a lot more sense once you recognise that they are primarily in the business of putting out monthly installments of shared-universe fantasy serial fiction for an audience of long-term subscribers, rather than that of producing usable adventure modules for people to actually run at the gaming table. Now, reading RPG books as fiction is a pretty harmless pursuit - and it's certainly one I've engaged in myself at various points in my life, when my circumstances made actual gaming impossible. However, problems can arise out of mismatched expectations - and the books themselves often aggravate this, by pretending to be things that they quite transparently are not. 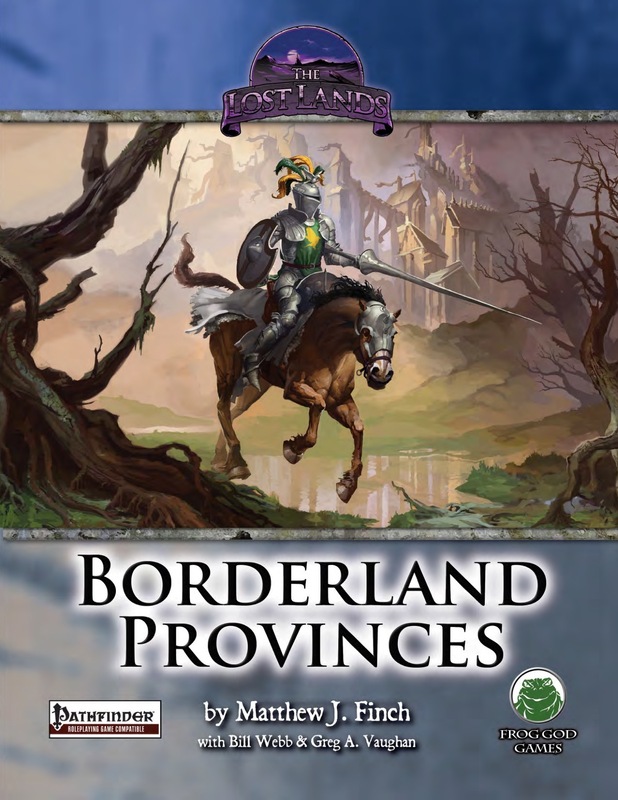 I recognise, of course, that the same book can serve different functions to different people: after all, many groups apparently do play through Pathfinder adventure paths exactly as-written, even though I struggle to understand how. But all too often, RPG books are riddled with what I've sometimes seen described as 'cargo cult design': the insertion of material (e.g. backstory, read-aloud text, extensive NPC statistics, price lists, floorplans, etc) simply because the authors have seen those things in other RPG books, rather than because they actually help the book to function in its primary role. Of course, I don't expect any author of RPG books to actually admit that their books are primarily intended to be read as fiction rather than used at the table: doing so would destroy the whole illusion on which the 'RPG book as fiction' subgenre is built. But I think that a bit more honesty and clarity about whether a given book is actually intended for use directly as-written or as a source of indirect inspiration, and a bit more effort devoted to matching form to function, could often go a very long way!